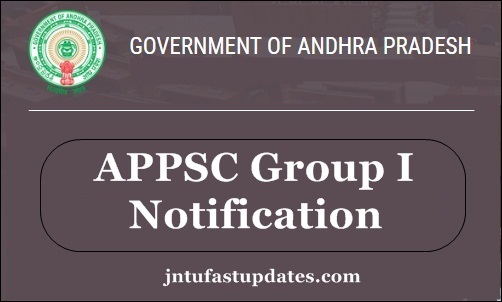 APPSC Group 1 Notification 2019, Online Application Form: Andhra Pradesh Public Service Commission (APPSC) has released Group I Recruitment notification 2019 for 169 posts. Aspirants eligible to apply for APPSC Group 1 posts can utilize this opportunity and apply from the Group 1 posts within the scheduled dates. As every year, the Andhra Pradesh PSC announced various posts includes, Deputy Collectors, Commercial Tax Officer, District Fire Officer, Deputy Superintendent of Jails, DSP (Civil), Assistant Prohibition & Excise Superintendents, Regional Transport Officer (RTO), Assistant Treasury Officer (ATO) / Assistant Accounts Officer (AAO), and Mandal Parishad Development Officer (MPDO). Aspirants having the suitable educational standards can apply through APPSC website, psc.ap.gov.in. Go through the article for more information such as eligibility criteria, application process, important dates, and more aspects. Last date for submission of applications for the post of Group-I Services (Notification No. 27/18) is extended up to 07/02/2019 (Note:06/02/2019 is the last date for payment of fee up to 11:59 mid night). APPSC Group 1 exam Rescheduled, prelims on March 31. Applications are invited online for recruitment to the posts falling under Group-I Services for a total of 44 CF and 125 Fresh vacancies. The proforma application will be available on Commission’s Website (https://psc.ap.gov.in) from 07/01/2019 to 07/02/2019 (Note: 06/02/2019 is the last date for payment of fee upto 11:59 mid night). Tentatively the Preliminary Examination (Objective Type) is likely to be held on 31/03/2019 in offline mode. Tentatively the Main examination (Conventional type) likely to be held from 10/06/2019 to 22/06/2019. Andhra Pradesh Public Service Commission is also known as APPSC in the usual language. This is the state government organization works for various operations related to the associated organizations. Every year, the APPSC releases various job notifications such as Group 1, Group 2, Group 3 and other categories to hire the suitable candidates into various AP state government jobs. Based on the skill and merit of aspirants they will be employed for the announced posts. For screening of aspirants, the organization will conduct the preliminary test, mains test, and interview rounds. Candidates who ever qualifying all these rounds with good merit will be employed by the AP government into various designations. Hopefuls applying for APPSC Group 1 posts can check the official notification thoroughly before applying for the posts. 01 Deputy Collectors in A.P. Civil Service (Executive Branch). 02 Assistant Commissioner of State Tax in Andhra Pradesh State Tax Services. 03 Deputy Supdt. of Police (Civil) Cat-2 in A.P. Police Service. 05 District Fire Officers in A.P. Fire Service. 06 Asst. Treasury Officer/Asst. Accounts Officer in A.P. Treasury & Accounts Service. 08 Assistant Prohibition & Excise Superintendent in A.P. Excise Service. 09 Mandal Parishad Development Officer in A.P. Panchayat Raj and Rural Development Service. 10 District Registrars in A.P. Registration Service. 12 Deputy Registrars in A.P. Cooperative Service. A.P. Panchayat Raj & Rural Development Service. 17 Municipal Commissioner Grade-II in A.P. Municipal Administration Services. 18 Administrative Officer / Lay Secretary & Treasurer Grade.II in A.P. Medical and Health (Administration) Service. 19 Assistant Audit Officer in A.P. State Audit Service. Must possess a Degree of a University in India established or incorporated by or under a Central Act or a State Act or any other equivalent qualification. For Post Code No. 01, 02, 06, 07 & 09 to 19:- No person shall be eligible for direct recruitment if he/she is less than 18 years of age and if he / she is more than 42 years of age as on 01/07/2018. How to apply APPSC Group 1 Posts 2019 Online Application Form Registration? Also, the aspirants can find the ‘APPSC Group 1 Online application form 2019’ on the website. 1.2 How to apply APPSC Group 1 Posts 2019 Online Application Form Registration? I had,have the otr,but I missed registered sim. How can I get OTR? I completed my bachelors degree through distance education on the basis of 10th class and again i completed my mba programme(PG) on regular basis. Can i apply group1 deputy collector post. i am studying 3rd year B.A. im in final year, i will get my Btech degree in 2019 may can i eligible for this job? Sir now I'm studying 2nd yr btech.can i apply for group 1 exams…. For BC category age relaxation?